First, Campbell discovered that Moscow had compromised an American uranium trucking firm, Transport Logistics International (TLI) in violation of the Foreign Corrupt Practices Act – which bribed a Russian nuclear official in exchange for a contract transport Russian-mined U.S. uranium, including “yellowcake” uranium secured in the Uranium One deal. An extremely important aspect of Campbell’s timeline is that the Obama FBI, headed by Robert Mueller, knew of the bribery scheme with the transportation company before approving the Uranium One deal which would have utilized TLI for transporting the mined uranium. Fox News viewers are demanding the network fire resident liberal Shep Smith after the host embarrassed himself in a wildly inaccurate and poorly researched “fact check” of the Uranium One scandal on Tuesday, following reports that Attorney General Jeff Sessions was exploring a special counsel to investigate the sale of Canadian firm Uranium One to Kremlin-owned Russian energy giant Rosatom. The nuclear deal, which ultimately resulted in the transfer of 20 percent of American Uranium to Russia so they could sell it back to US nuclear plants at an enormous profit, was approved by the Obama administration after significant donations in excess of $140 million were made to the Clinton Foundation by Uranium One affiliates. Unlike Sean Hannity – Ol’ Shep clearly hadn’t done his homework – consistently mispronouncing the names of people involved in the case, telling viewers that Canada-based Uranium One is a South African company, and spewing inaccurate and misleading facts regarding the CFIUS (Committee on Foreign Investment in the United States) which approved the deal. While Smith claimed that the majority of donations to the Clinton Foundation were from Frank Giustra – a mining financier who sold his stake in Uranium One before it was acquired by Russia, and before Clinton was Secretary of State – he fails to mention the history between Giustra and the Clintons. Smith also misled viewers over the fact that while while nine agencies which comprise the CFIUS, the decision to approve the Uranium One deal was ultimately Obama’s. This is incorrect, as any one of the nine agencies involved had the power to veto the deal. Another key fact omitted by Smith was the timing of funds flowing to the Clintons – including the $500,000 speaking fee Bill Clinton was paid by a Russian bank which issued a “buy” rating to Uranium One during the CFIUS review process. Notably, Bill Clinton was at Vladimir Putin’s HOUSE the same day he gave the speech. Maybe he was checking out Vlad’s Russian tie collection? Reports from both the New York Times and The Hill reveal that yes – uranium left the US on multiple occasions. In fact, the Obama administration approved its export through a Uranium trucking firm based in Canada. No mention by Smith, of course. The Hill also reported that an FBI mole embedded in the Russian nuclear industry gathered extensive evidence that Moscow had compromised an American uranium trucking firm in violation of the Foreign Corrupt Practices Act – a scheme of bribes and kickbacks to the company which would ostensibly transport the U.S. uranium sold in the ’20 percent’ deal. Smith also leaves out a new report that the FBI scrambled to issue records-retention requests to all 9 member agencies of the CFIUS weeks after they cracked into Hillary Clinton’s email investigation. Shep also fails to mention that the Podesta Group received $180,000 to lobby for Uranium One during the same period that the Clinton Foundation was receiving millions from U1 interests, and after Russia took majority ownership in the “20 percent” deal (source – you have to add up the years). Moreover, a former executive of the Podesta Group told Fox’s Tucker Carlson that Tony Podesta regularly met with the Clinton Foundation to coordinate the Uranium One deal, and was “basically part of the Clinton Foundation.” Moreover, the former exec claims that John Podesta – Clinton’s Campaign manager and long time DNC operative, recommended David Adams, Hillary Clinton’s chief adviser at the State Department, giving them a “direct liaison” between the group’s Russian clients and Hillary Clinton’s State Department. 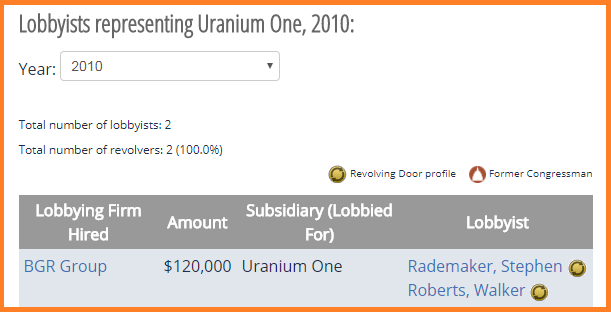 June 2010, Rosatom takes majority (51%) ownership of Uranium One, granting the Kremlin control over 20 percent of U.S. uranium – which Hillary Clinton’s State Department signed off on. The FBI uncovers massive bribery scheme before CFIUS approves deal. June 29th, 2010, Bill Clinton meets with Vladimir Putin at his home in Russia. Later that day Clinton earns $500,000 for a speech in Moscow to Kremlin-linked investment bank Renaissance Capital, which assigned a “buy” rating to Uranium One stock. Sitting down with Mother Jones, Hillary Clinton called any investigation into the Uranium One deal “an abuse of power” – of course. As the mainstream media continues to obsess over $100,000 worth Facebook ads allegedly purchased by Russian spies in 2016 seeking to throw the presidential election, behind the scenes, far removed from the sight of CNN and MSNBC, the Uranium One scandal, in which the Obama administration approved a deal that handed a Russian-controlled corporation 20% of America’s uranium reserves despite the existence of an FBI investigation into ongoing illegal bribery, extortion and money laundering schemes, is slowly spiraling out of control…despite CNN’s continued ignorance of the topic. That said, one thing that you probably don’t know yet, primarily because of the Obama administration’s proactive attempt conceal such information, is that despite repeated assurances from Congress and Obama’s Nuclear Regulatory Commission that U.S. uranium reserves wouldn’t leave U.S. shores, it, in fact, did. “No uranium produced at either facility may be exported,” the NRC declared in a November 2010 press release that announced that ARMZ, a subsidiary of the Russian-owned Rosatom, had been approved to take ownership of the Uranium One mining firm and its American assets. “Neither Uranium One Inc. nor AMRZ holds a specific NRC export license. In order to export uranium from the United States, Uranium One Inc. or ARMZ would need to apply for an obtain a specific NRC license authorizing the exports of uranium for use in reactor fuel,” then-NRC Chairman Gregory Jaczko wrote Barrasso. The NRC never issued an export license to the Russian firm, a fact so engrained in the narrative of the Uranium One controversy that it showed up in The Washington Post’s official fact-checker site this week. “We have noted repeatedly that extracted uranium could not be exported by Russia without a license, which Rosatom does not have,” The Post reported on Monday, linking to the 2011 Barrasso letter. That said, new memos obtained by The Hill now confirm that, in fact, Uranium One yellowcake did manage to escape U.S. shores repeatedly between 2012 – 2014. Of course, given his repeated assurances to the contrary, Obama couldn’t simply allow Uranium One to ship uranium to the nearest port for export, so he instead signed a waiver allowing a Kentucky trucking company to carry the product across the Canadian border and then approved export from Canada to Europe. 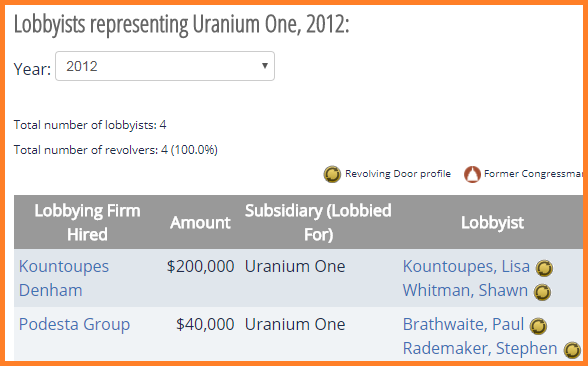 Rather than give Rosatom a direct export license — which would have raised red flags inside a Congress already suspicious of the deal — the NRC in 2012 authorized an amendment to an existing export license for a Paducah, Ky.,-based trucking firm called RSB Logistics Services Inc. to simply add Uranium One to the list of clients whose uranium it could move to Canada. And while it will be dismissed by the Left as a convenient attempt for Republicans to change the “Russian collusion” narrative, Senator Chuck Grassley and others are finally starting to press for a special counsel to investigate what is clearly a scandal that is far more pervasive than anyone originally thought. So, is this what Obama meant when he told Russian President Dmitry Medvedev to let Putin know that he would “have more flexibility” after the 2012 election?